Braids featuring the Military Police Corps’ branch colors of Green and Yellow (cable 65007 and 65002, respectively) are found on hatbands of the service caps worn by Company- and Field-Grade officers, as well as on the service caps worn by all ranks of Warrant Officers (W-1 TO W-5). Depending on rank, ornamental braid made using the branch’s first-named color Green is also found on the sleeves of Army Service Uniform and the Blue Mess Dress Uniform (male and female), and the lining of the Blue Cape for females. Under one designation or another, Military Police have been a part of the United States Army almost from its inception—but for over 160 years they were the military equivalent of temp labor. From the time that Congress authorized George Washington in 1775 to hire a “provost Marshal” up until September 1941, in fact, the United States Army did not have a permanent cadre of Military Police units. Instead, at the outbreak of a major conflict Congress would authorize the Provost Marshal General office and with it the power to assigns soldiers to carry out various Military Police duties, then close it down as soon as the fighting had ended. Before the Civil War, for example, Army regulations specified that the “general in chief” could create a provost guard under a provost marshal for the Army or for each Army corps or division. Union General Irwin McDowell exercised that power before the first major battle of the war took place, ordering each regimental commander to appoint a provost marshal who would then pick ten soldiers to serve as a police force. Following the Union defeat at Bull Run and the fear of mayhem caused by fleeing Northern troops (or pursuing Southern troops) entering the city, General George McClellan appointed Colonel Andrew Porter as temporary Provost Marshal of Washington, D.C. with all regular troops in the area being delegated as provost guards. But it took an Act of Congress to establish the Provost Marshall General’s Office in the War Department on March 3, 1863—an office that was then abolished, again by Act of Congress, roughly 16 months after the Confederate surrender. 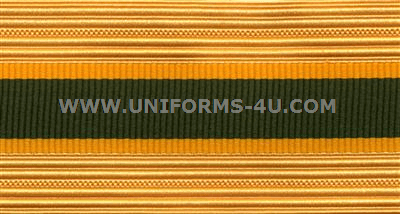 Military Police units were assigned colors—yellow piped with green—in 1922, at a time when the Office of Provost Marshal General was not in effect and the establishment of Military Police as a basic branch was still almost twenty years away: Given the on-again, off-again history of the future branch, it was perhaps only fitting that Military Police units would be forced to reverse those colors to the current green piped with yellow once it was announced that yellow would be the color of Armor and that Armor would also be using green for the insignia on its branch flag. The Military Police Corps was established as the Corps of Military Police on September 26, 1941, and the current colors were assigned by Army Regulation 600-60-1 published October 26, 1951.